Chinese furniture-makers used different tools to those used by others. They worked with smoothing planes of varying lengths and that were remarkably low-slung, with a characteristic cross-handle behind the iron. A variety of other planes can also be found which perform functions such as rebating, grooving, chamfering and bevelling. An ancient Luban carpentry ruler (Luban Chi) has recently been in the spotlight in Zhaoyuan in Yantai, east China's Shandong province. An amateur photographer said he received it from a Taoist priest. 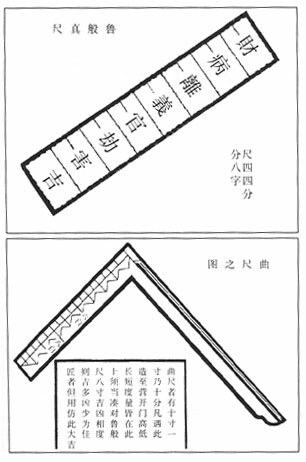 Yantai Evening News reports the ruler is nearly 461 centimeters long and divided into eight bigger spaces which contain a number of smaller spaces. It was reportedly made by legendary ancient Chinese engineer and carpenter Lu Ban some 2500 years ago. While antique lovers frequently boast about the quality of specific furniture pieces - referring to wood, joints and overall design - it's quite often the style of decoration that sets them apart as works of art. Carving, gilding, inlay, veneer, measure - these are just a few decoration methods that give antique furniture pieces their signature style. Carving refers to the shaping and paring of wood with chisels or other sharp tools. The carving of some pieces, especially the intricate carvings of the middle to late Victorian era, displays the unsurpassed artistry of furniture carvings. Excellence might be evident in a botanical scene carved onto a wooden chair back or revealed by ornately carved table legs. In any case, densely-grained woods are best for carving. Inlay is also created with chisels. A piece of furniture may be enhanced by carving small notches in the wood for fitting precious metals, stones or minerals into place. Ivory, abalone and mother-of-pearl were popular choices to use for inlay. The more expensive the inlay, the more valuable the piece of furniture on the whole. Many inlay designs feature actual scenes or objects portrayed by the pattern by which the precious material is laid. Ornate inlay can be quite exquisite and render a piece a substantial work of art and craftsmanship. Veneer was a commonly used decoration style for furniture. A less valuable wood might construct something like a desk or large armoire. To cover this coarser variety, sheets of fine (and more expensive or rare) wood would be applied over the piece. In fact, many kinds of precious wood, such as satinwood, were reserved only for veneer because it was quite rare. Veneer by no means would render a piece less worthy of top-notch status. However, a solid piece of mahogany furniture is necessarily more valuable than one featuring a veneer surface of mahogany. Of course, this is not always the case depending on the era of the piece and quality of workmanship. Marquetry is a veneer style that employs different wood veneers to create a design or pattern. Marquetry can be intensely pleasing as it so often creates a one-of-a-kind piece. Contrasting wood colors form pleasing arrangements to render the piece, again, a work of elegant artistry. An ancient craft, it also can resemble inlay - only the work is in wood veneer as opposed to precious metals like silver or gold. Oak furniture was painted as early as the fourteenth century. While popular today, painted antiques of the eighteenth century, for example, might be painted with borders or interesting focal points and then covered with varnish. Later pieces of furniture were painted to resemble precious wood grain or marble. Gilding refers to covering a piece with precious metal such as gold leaf. Unlike inlay, there is no carving involved. There is usually an element that operates like an adhesive so that the gold leaf will adhere to the wood's surface. Bronze and copper were also frequent gilded metals used to cover a surface. Lacquering, not surprisingly, was sometimes termed "japanning," as it was indeed an Oriental finish. As the Chinoiserie style commanded a prominent role during the Victorian and even earlier eras, lacquered furniture was considered quite a la mode. Not simply a matter of decoupage, authentic Oriental lacquered antiques might contain up to two hundred layers of lacquer - a painstaking process that rendered the object almost glistening with satin-like luster. Finding antiques decorated with any of these styles can be a most enjoyable experience. Some pieces might contain various types of decoration together - a Marquetry tabletop later coated with lacquer, for instance. Personal taste will ultimately determine what decoration appeals to you - some styles like gilt work are quite showy, perhaps even gaudy for some tastes. However, when the artistry is first rate, the value of the antique will doubtlessly be apparent upon close inspection.